Take a virtual tour of places of interest in and around the historic city of Norwich, presented as a series of interactive 360-degree panoramas in which you, the viewer, can ‘turn the camera’ to look left and right and up and down. Each place of interest can be selected on the following pages, either from a thumbnail image or from a map of the relevant area, and each is presented on its own page, with an introductory image, a brief description and two or three supporting photographs. Clicking the introductory image will take you to one or more panoramas of that location or, in some instances, a more comprehensive virtual tour. Our guide was launched as a work in progress only in early 2017, so the contents are as yet quite limited, but we expect to be adding more locations on a regular basis as time goes by. Please take a look and, if you like what you see, stop by from time to time and visit our blog, where we will post news of the latest additions and any other information of interest. We hope the content presented in the following pages will whet your appetite to visit our fine city in person – you will be made most welcome! A silver penny from the reign of king Cnut (Canute), 1016-1035. The inscription on the obverse reads CNUT REX ANGL (short for Anglorum), i.e. Cnut King of the English. The reverse is inscribed HPATMAN O NORD, indicating the coin was minted by a moneyer named Hwateman at the Norwich mint. 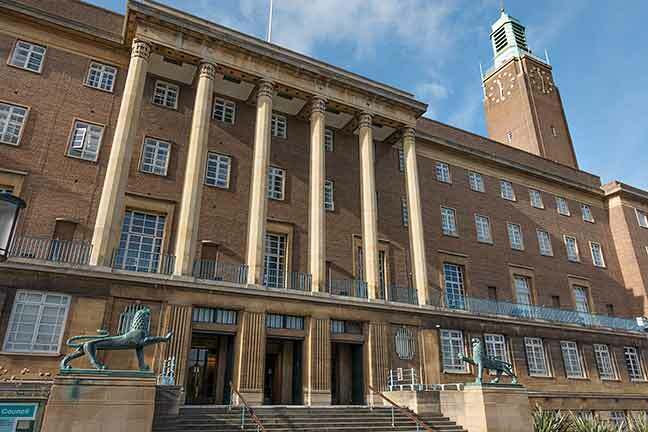 Built in the Art Deco style, and surely one of the finest civic buildings in the land, Norwich City Hall was opened by King George VI in 1938, some 900 years after the coin, above, was minted nearby. With the recent discovery of human footprints in a layer of newly uncovered sediment on a beach at Happisburgh, some twenty miles from Norwich, man's presence in the region can be dated back at least 850,000 years. Flint tools, some dating back 500,000 years, have been found during excavations at a number of sites in the area. Aerial photographs from 1929 and a subsequent excavation in 1935 revealed the existence of a neolithic henge and timber circle dating from around 3000 BC at Arminghall, a village some three miles south of present day Norwich and adjacent to the river Tas, a major tributary of the Yare. The latter now flows through mostly reclaimed marshland to join the North Sea some twenty miles downstream at Great Yarmouth, but back then sea levels were higher, and Arminghall stood close to the head of a wide estuary. A short distance away, close to what is now the village of Caistor St Edmund, are the remains of the Roman town of Venta Icenorum. Before the Romans invaded in 43 AD, Venta had been the regional capital of the Iceni tribe who, in about 60 AD and led by their queen Boudicca, rebelled against the Roman occupation and sacked the towns of Colchester, London and St Albans before they were finally defeated. It was not until Anglo-Saxon times that a small number of settlements were formed within the limits of what is now the modern Norwich, in an area close to both the river Wensum and the intersection of two Roman roads. As these villages expanded, their boundaries merged to form a small town. Following the frequent incursions by the Danes in the ninth and tenth centuries the town had acquired fortifications and a marketplace. Evidence of the Danish occupation survives in several street names ending in gate, for example Fishergate and Pottergate, gata being the Danish word for a street. Further growth was rapid, and by the time of the Norman conquest the town had become a borough of considerable significance. In about 1095 the Norman bishop Herbert de Losinga moved the diocesan see from Thetford to Norwich and shortly afterwards commenced the building of Norwich Cathedral. At the same time Norwich Castle was also being built, not so much as a fortification but as a royal palace. Norwich was granted city status in 1194 by Richard the Lionheart. In the last half of the sixteenth century the population of Norwich was swelled by an influx of Flemish weavers and their families seeking refuge from religious persecution in the Netherlands. This led to a revival of Norwich and its surrounding area as an important centre for the woollen and textile trades, and by the mid-seventeenth century Norwich had grown to become second in size and importance only to London. It is said that at one time Norwich had a church for every week of the year and a pub for every day — the city still has more standing medieval churches than any other in western Europe north of the Alps. Today, Norwich is a lively, vibrant city, and has expanded far beyond the boundaries defined by the medieval city walls – the 2011 census returned a population of over 213,000 for the area comprising the city and its suburbs. In 2012 Norwich was declared England's first UNESCO City of Literature. Norwich is twinned with Rouen in France, Koblenz in Germany, Novi Sad in Serbia and El Viejo in Nicaragua. Built in the Art Deco style, and surely one of the finest civic buildings in the land, Norwich City Hall was opened by King George VI in 1938, some 900 years after the coin, left, was minted nearby. 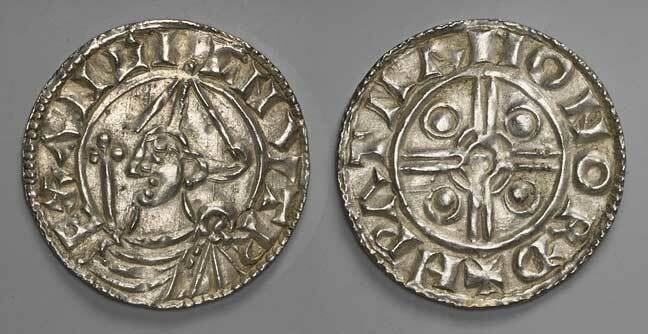 A silver penny from the reign of king Cnut (Canute), 1016-1035. The inscription on the obverse reads CNUT REX ANGL (short for Anglorum) i.e. Cnut King of the English. The reverse is inscribed HPATMAN O NORD, indicating the coin was minted by a moneyer named Hwateman at the Norwich mint.